The United Kingdom has dispatched military aircraft, charter planes and the warship HMS Cumberland to evacuate Britons from Libya. The SAS – Britain's most highly-trained special forces – are reportedly on standby. Italy sent two huge cargo aircraft to bring their citizens home, according to wire reports. Meanwhile, the citizens of the world's most powerful country find themselves in a different boat altogether – one that's not moving anytime soon. After Libya denied a U.S. request on Tuesday to use a charter plane to airlift Americans out of the country, the State Department decided to evacuate Americans by sea. The U.S. government charted a 600-person ferry, the Maria Dolores, to take Americans to the nearby island nation of Malta. Americans arrived at the dock Wednesday and were processed onto the boat, but the ferry did not leave because of inclement weather. Although other boats are battling the rough seas, the ferry will not be leaving today, according to the ferry operator Virtu. The captain of the boat will reassess the weather tomorrow morning. Until then, the 285 people on board, including 127 Americans, will stay on the ship. The passengers are reportedly being well taken care of – given meals, pillows, blankets and sleeping bags. 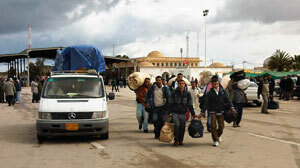 The State Department said today that Libyan security was guarding the port. The United Kingdom is working with its NATO allies to evacuate British oil workers trapped in camps in the Libyan desert, according to the UK Press Association. The British government believes some of the camps may have been attacked and looted. "They are in a perilous and frightening situation," British Foreign Secretary William Hague said of the oil workers. "We are working intensively on a range of options to secure their safe passage from Libya, working with other countries whose nationals are in the same position," he said in a statement. Several petroleum companies with a presence in Libya said in recent days they were in the process of activating emergency plans to evacuate workers and shut down wells, a process that takes a few days. "In Libya what is happening is civil strife," the statement continued. "A country split geographically in two, split between government and people, and with widespread breakdown of law and order." Over 350 Britons have been evacuated from Libya since the crisis began, including those taken out by sea on the HMS Cumberland – which is expected to arrive in Malta Friday morning. U.K. Defense Minister Liam Fox said that there would be "international coordinated effort" to get Britons home safely and "out of harm's way." "We may be taking out citizens of other countries, other countries may be taking out UK citizens," Fox said. "The better we have it coordinated and de-conflicted, the better the chances of success. That is what we will be doing, I imagine, through the night tonight and over the weekend." One possibility Fox discussed was a caravan by road to Egypt or Tunisia. A difficulty evacuees face is that the country is not under control of a single political or military force. The port city of Benghazi, for example, is held by non-government forces. In a daily press briefing Thursday, US State Department spokesman P.J. Crowley said that the situation in Libya was different than the revolution that transpired in Egypt. "Here you do have a situation where the central government has lost control of portions of its country," he said.